Wow! a month has gone by already - have you joined in with Creative Craft World's Beat the Christmas Rush? If you're wondering what I'm talking about, here's the deal. Each month there will be links posted on CCW to Christmas cards made by the design team and the target is to make up to 5 cards each month so that we Beat the Christmas Rush and have lots of cards ready to write when December arrives. These are my cards for this month. You might be thinking that the background papers aren't Christmassy but I've been having a declutter in my craft room and came across them, unused because they were too nice to use so I decided to challenge myself to make Christmas cards out of them! If you click on the image it will appear much bigger. Every one who leaves a comment on my blog every month until November will be entered in to my own prize draw and I will send one person a little something. Out of the cards that entered last month over on CCW my favourite was Alison and these are her cards. I love these cards, Susi. The colours are great and the images so cute. 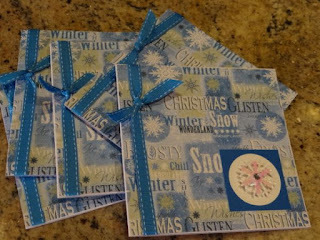 great use of non-seasonal papers, lovely cards!